I have been first author or co-author on many scientific papers on crocodiles and caimans, but those papers will not give insights into the real reason that I was involved in the studies. As Sir Peter Medawar stated honestly in a BBC Broadcast in 1964, the scientific paper is a fraud. It presents a logical argument for why you should have done the research, not the real reason, or even the true sequence of events that led to the results. Tony Pooley wrote a wonderful book about his journey to becoming one of the foremost experts on crocodilian behavior, and Tony encouraged me to write an honest account of what makes a crocodile biologist tick. That was a long a time ago, and Tony has passed on to that great river in the sky where presumably all great crocodilian biologists go. However, his words continue to excite the imaginations of young naturalists, and his book is an example of honest story telling that no scientific paper can match. Charles Darwin’s ideas on evolution were forged during an around-the-world adventure. Eric Pianka’s fame as a community ecologist is rooted in love of deserts and desert lizards. Without adventure, there is no science. Many people helped me on my journey, and I hope I can do justice to most, but memory is fallible, and I will certainly have omitted influential persons and forgotten important facts. Occasionally I will have gotten the chronology wrong. Nevertheless, I hope I have portrayed accurately the emotions that motivated me to study crocodiles and their relatives. Science is about emotions and human interactions, and that is what this book is about. He has studied crocodilians for the past 40 years and is the author of more than 200 scientific publications on subjects ranging from statistics to biodiversity. 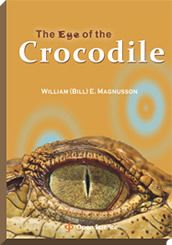 Bill graduated from the University of Sydney in 1974 and carried out research in Arnhem Land for his Ph.D. thesis. He has been a researcher with the Brazilian National Institute for Research in the Amazon (INPA) since 1979, and now coordinates the National Institute for Science Technology and Innovation for Amazonian Biodiversity (INCT-CENBAM). Bill has been the major professor for over 60 post-graduate students, and now lives with his wife and daughter in Manaus, Amazonas, Brazil. Readership includes those interested in crocodilians, those interested in how science is done, those interested in how scientists interact with local people, and the general public interested in an adventure story.